Maxie Heating & Cooling is proud to serve the Swedesboro community! About Swedesboro, NJ - Happy to be your hometown Heating & Air Conditioning Contractor! Swedesboro is a small town in New Jersey, home to approximately 2,500 residents. The name originates from the fact that a group of Swedes from Delaware and Pennsylvania were the earliest settlers in the area, moving in around the mid-1600s. The Swedesboro-Woolwich School District provides education services for K-6th g grade and the Kingsway Regional School District provides education services for 7th-12th grades. The National Arbor Foundation has named Swedesboro a Tree City USA since the year 2000. The Nothnagle Log Cabin, built in 1638, is the oldest known standing log cabin in North America. 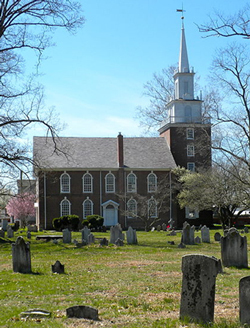 The Trinity Episcopal "Old Swedes" Church is a historic attraction, established in 1703 and many notable political figures are buried in the church's cemetery. Swedesboro rates above average for comfortable climate weather as the summers are warm to hot and winters are cold. The town has a friendly atmosphere and is a perfect getaway from the heat and the bustling city life.